Every year I declare a fish of the year on my boat, this year is a bit different. I’m declaring a fish of the year but its a fish which has never been graced with the title of “Fish Of The Year” on my boat prior to this year. Also, I’ve got an angler who is the first ever “twice” catcher of the “Fish of the Year”! 2017 has certainly been a spectacular season of large catches. Many huge Reds, Stripers, Specks and even Blues have come over the side this year! As I’m typing its December 15…..still some days ahead in 2017 for a huge fish to be caught. Only fish in these waters now-a-days is Striper, so…… kinda safe to say my boat won’t catch a true 50+ pound fish so I’m declaring the fish of the year a hair early. I will say, “hope I’m wrong”! If we get a huge fish, 50″/50 pounds, the catcher of the 50+ pounder will get a free trip in 2018! HERE’s Some honorable mention fish and anglers for 2017! 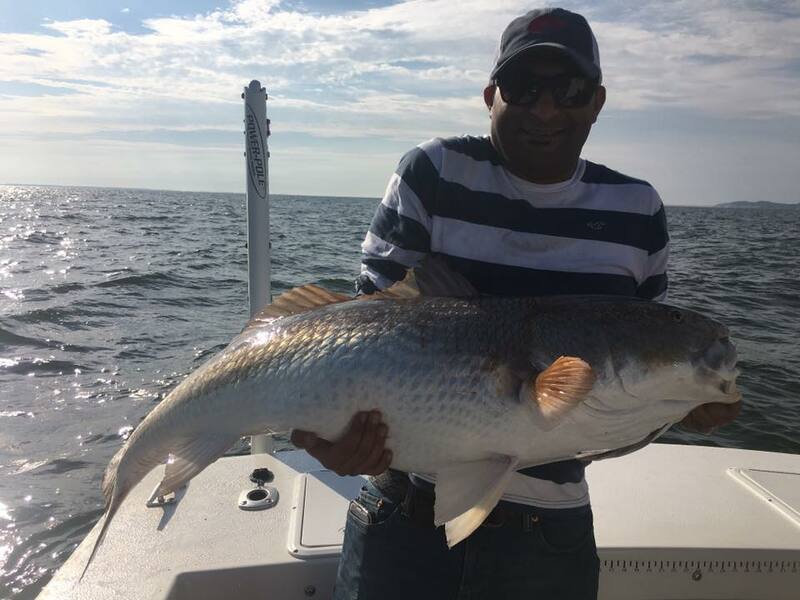 This huge Red was caught in Mid August and the first giant Red caught in 2017. The angler is a first- time ever angler! 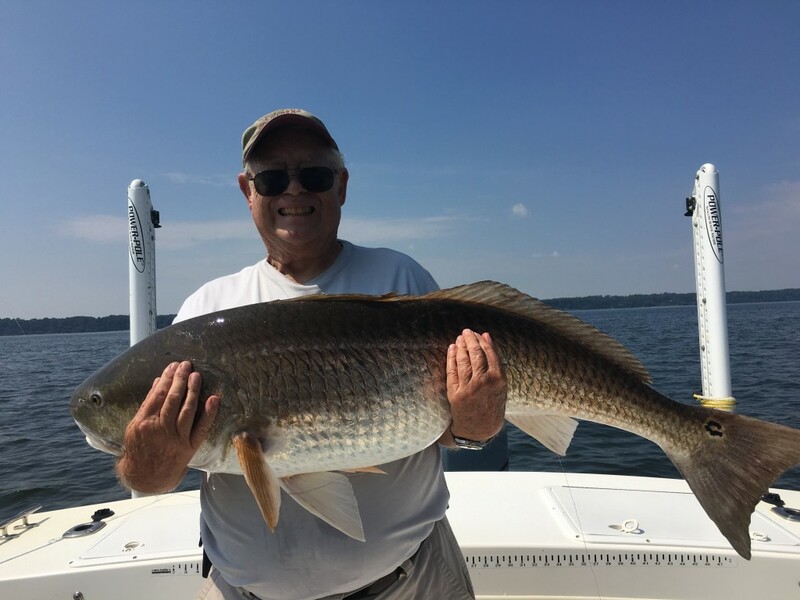 He listened well and learned quickly but was certainly overmatched a bit by this giant 47″ Red caught on a very light rod. We had some problems during the fight and the net but we did get the fish. He was released quickly and swam away hard! One of many giant Reds caught in 2017. 2017 was the best year on Specks since 2014. 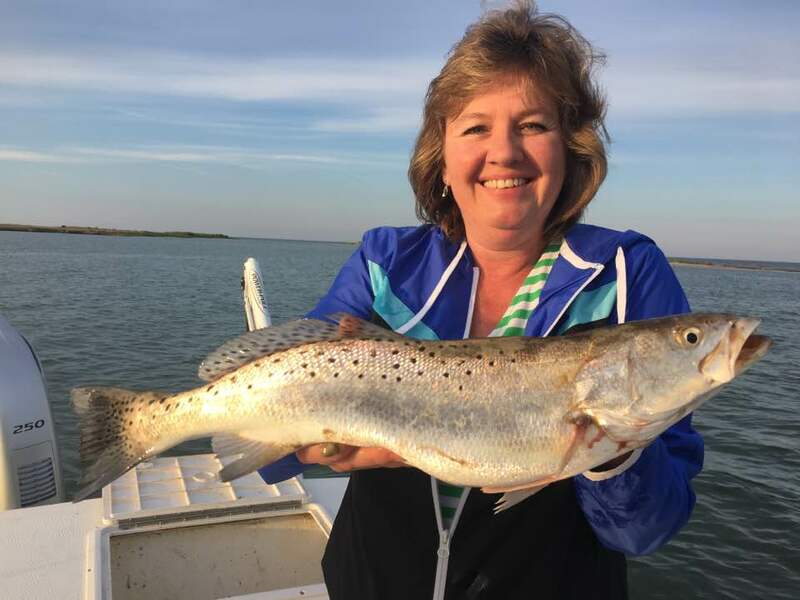 A wide spread cold shock winter kill of thousands of specks over 2 winters in a row made 2015 and 2016 very poor for catching Speckled Sea Trout in the Maryland waters I fish. Spring of 2017 was a pleasant surprise……..Specks started biting in late April and continued a strong showing in May. 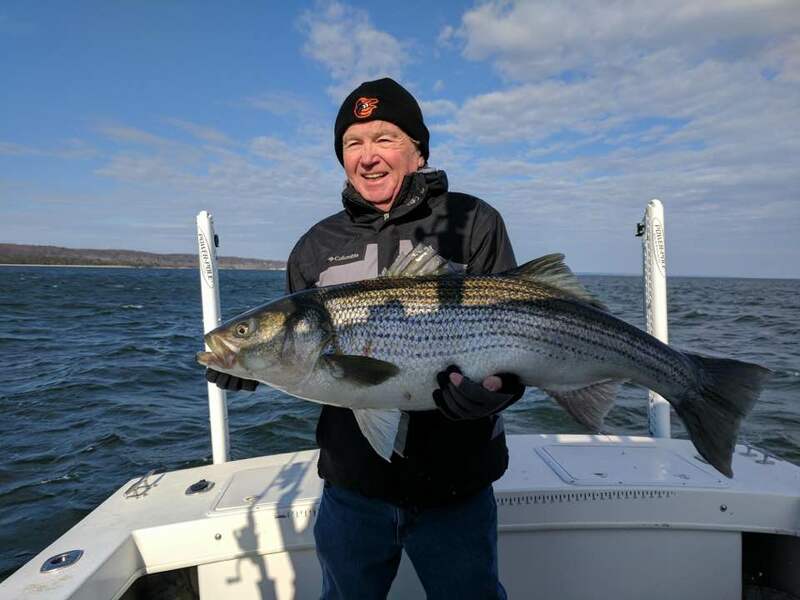 As May rolled into June it slowed down for me and the Stripers moved out of the islands for the most part so I moved north to pursue the large body of Stripers available in the main stem of the bay. 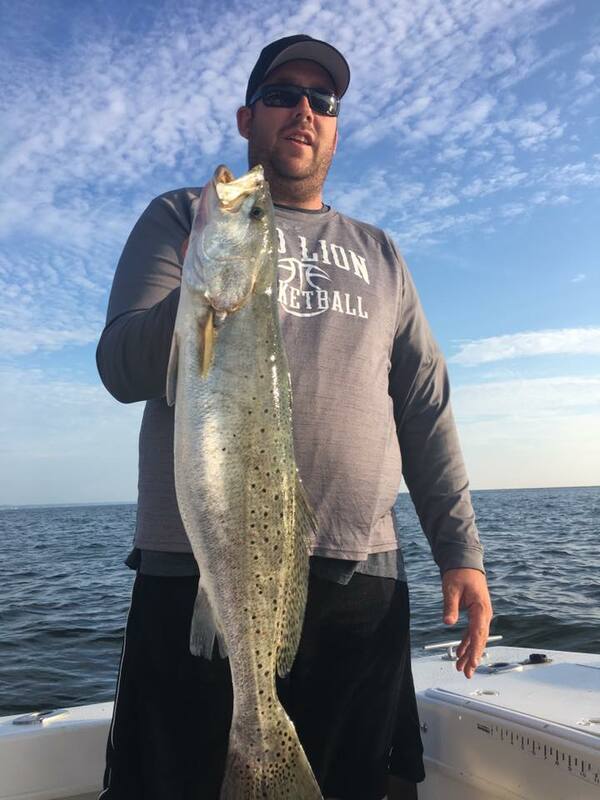 A Huge Maryland Speckled Sea Trout for Brandon! This massive Speck hit a Rapala XR-12 Crank Bait while fishing for Stripers……we’ll take that accident! Beautiful fish! 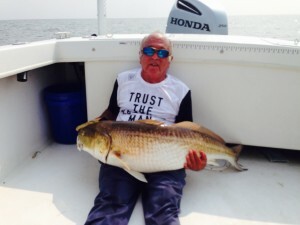 2015 Fish of the Year, 50″ Red! Way to go Billy! 2016 Fish of the Year catcher Freddy Menage lands an honorable mention Speck in 2017…….Freddy is the MAN! 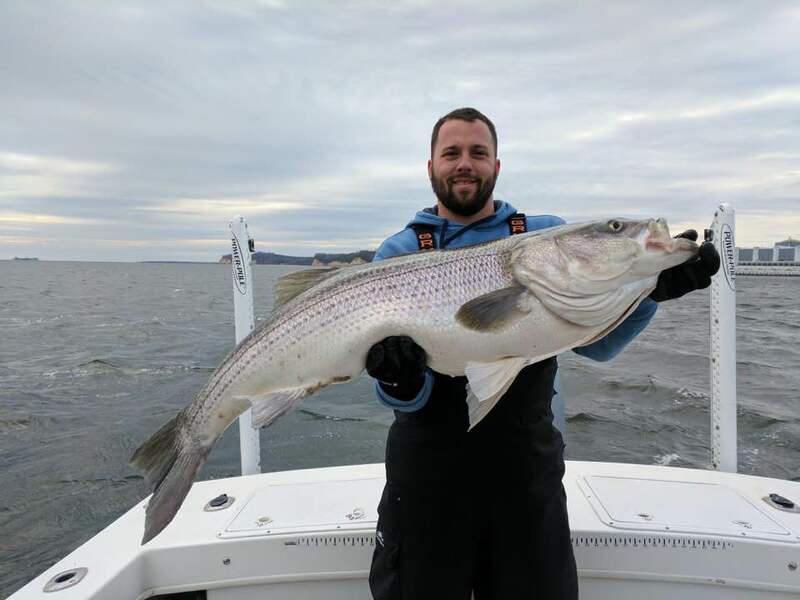 beauty at 47″……great Striper Kyle! Craig with a really big 47″er on a cold day! Craig gets the “most over 40″er” award for 2017! Craig is pictured above with his biggest of the winter, A true giant of 47″! On a 1/2 day trip to the plant in 2017 Craig caught 6 beasts over 40″ and probabaly lost a few more! The day was very windy and cold, no boat traffic and quite a few cooperative huge Stripers. Craig has the catching technique down to a science and truly “makes it happen” every time he’s on my boat. Congrats Craig for the best big fish day of 2017 on my boat! 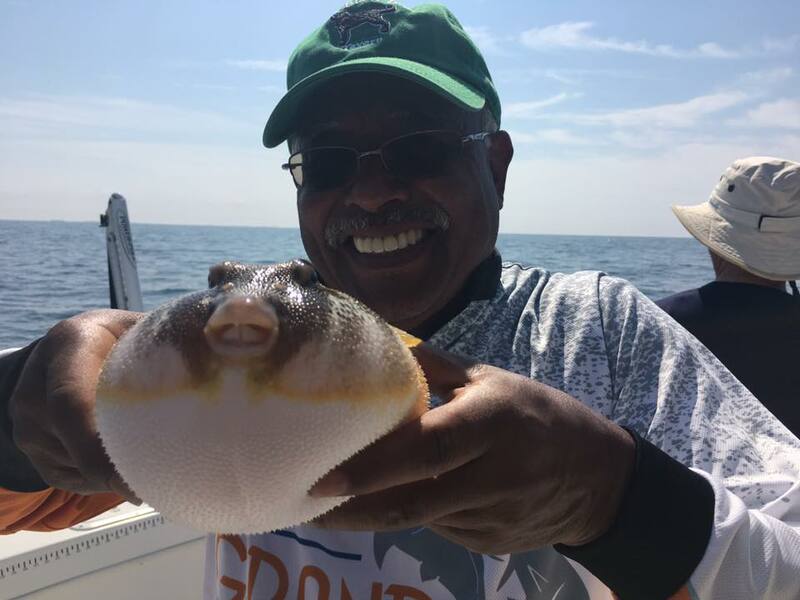 big ole’ blow fish! 2017′s best! Here’s the runner up for “Fish of The Year 2017″ ……it’s a fish we don’t catch a whole lot of and it’s the hardest puller out there and was caught on a very light stick by a Spectacular angler……my man Jason! Congrats on a light tackle giant! 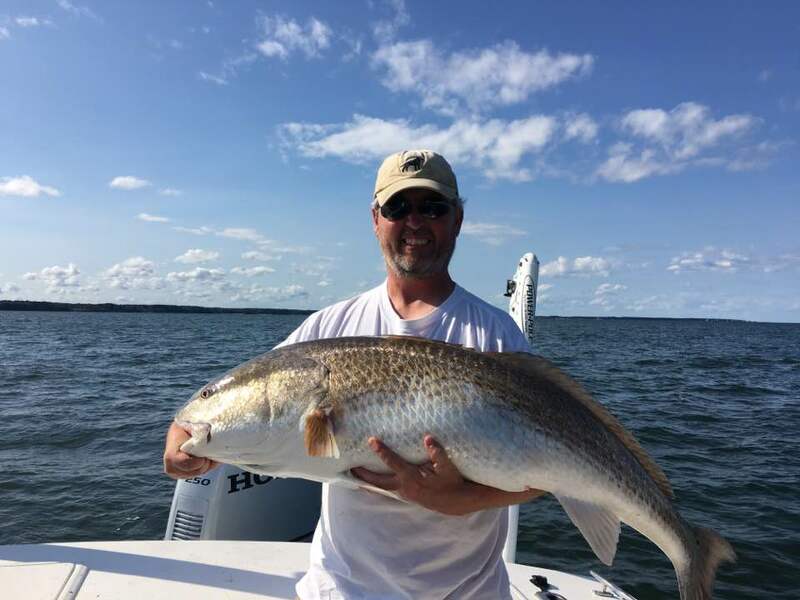 Jason Jernigan’s 50″ runner up Red! Majestic beauty of a fish! HERE WE GO……..2017 FISH OF THE YEAR! This fish was caught in the month of May with Billy……a guy who’s fished with me for years and has more ambition to fish than guys half his age. 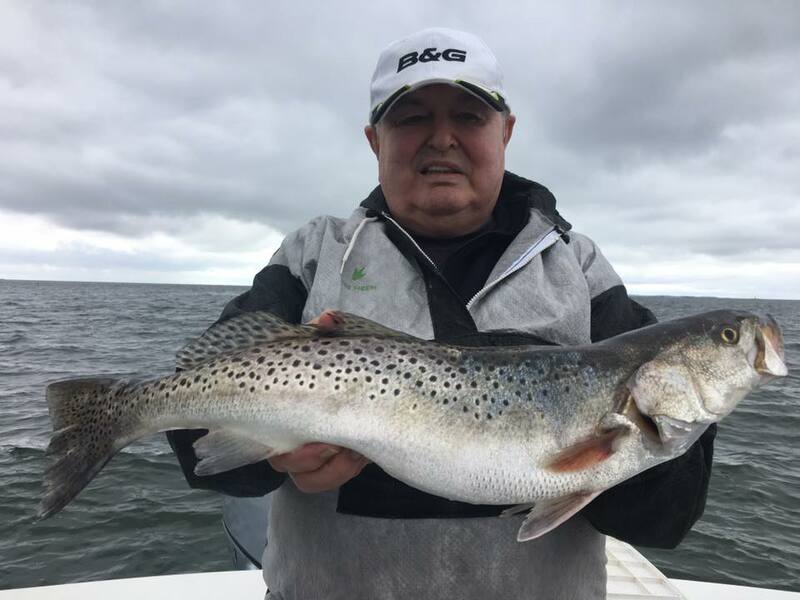 Every trip is an adventure with Billy and he never puts the rod down………heat of summer doesn’t slow him down…..truly incredible guy and outstanding angler……here’s the first ever fish of the year of this species and second time recipient Billy Brener! 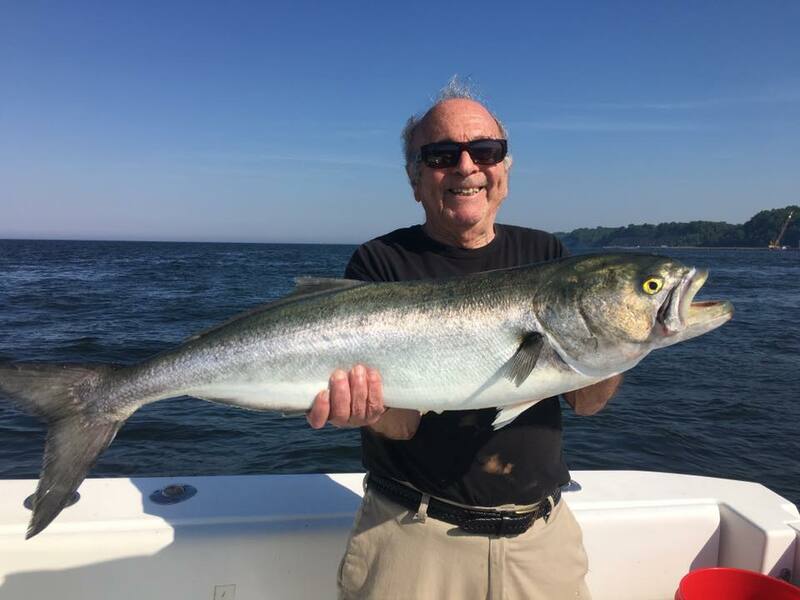 37″ Bluefish for Billy! 2017 FISH OF THE YEAR! Billy and I were fishing together in early May. Some nice Bluefish had moved into the region and some truly huge Bluefish of which I’ve never seen on the bay were lurking. Billy and I were drifting through an area which was holding some nice 4-6 pound Blues and small to medium sized Stripers. Billy is a comedien and even shorter than me by the way…….not kidding….he is! He was telling me a joke and gesturing with one hand and holding the rod and jigging with one hand as the boat was drifting along. 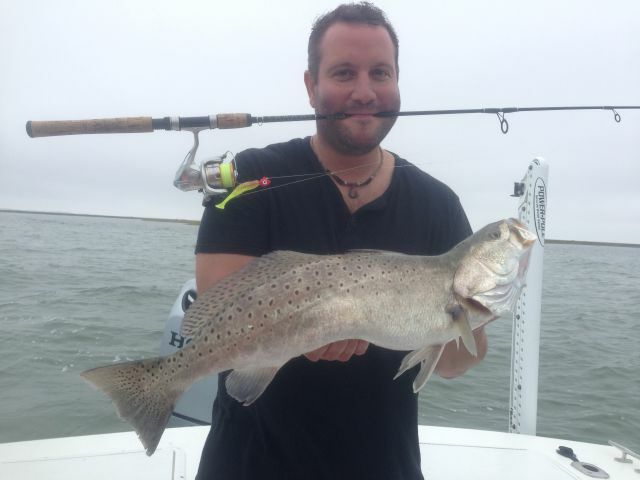 Billy was using a 1 ounce jighead and a 6″ Chartruese Glitter BKD (Bass Kandy Delight)……. before the punch line Billy all of a sudden lunged to his left as something large struck his lure……almost lost the rod before he got his other hand on the rod. Now….both hands on the rod and drag screaming Billy and I were thinking about what this might be. We thought big Striper but I didn’t think a Striper was going to pull with that much speed and the head shake on the rod wasn’t quite the same……my other thought was the dratted cow nosed Ray….they just began moving into the region. When they get hooked it’s not a good thing…..they pull hard an damage light tackle and usually you don’t get your lure back. I didn’t see anything to clearly show this creature on the other end of the line was a cow nosed ray so Billy kept on fighting whatever was pulling. Some time had passed and many runs were run. Finally the critter started coming up…….when the fish broke the top I couldn’t believe what I saw…….the biggest Blue I’ve ever seen. I know they were all over the ocean front this size but not in the bay. Billy and I got the blue in the boat as it’s jaws were a snapp’in! Truly a monster blue for Chesapeake Bay and I hadn’t seen one that big……….so………fish of the year it is! 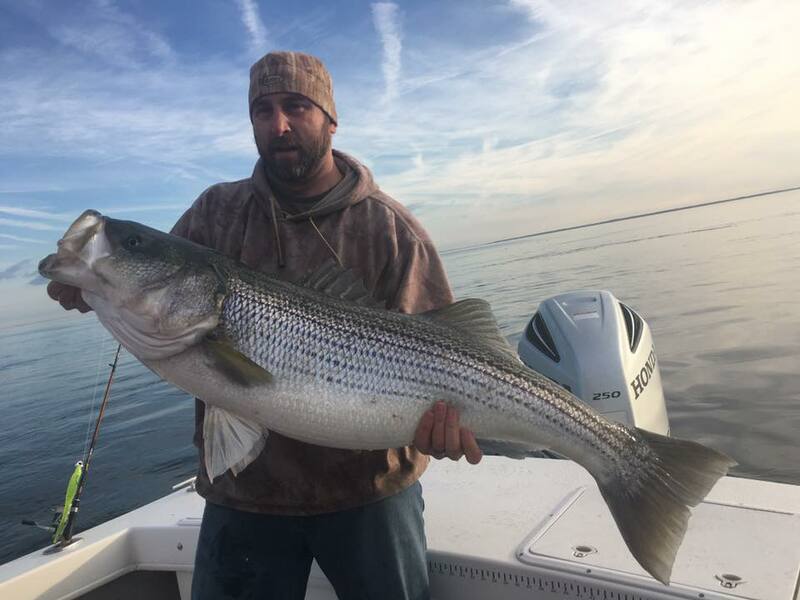 Congrats Billy on a great fish and a rarity for our portion of Chesapeake Bay! Full 2017 year in review coming soon with a preview of whats coming up in 2018!